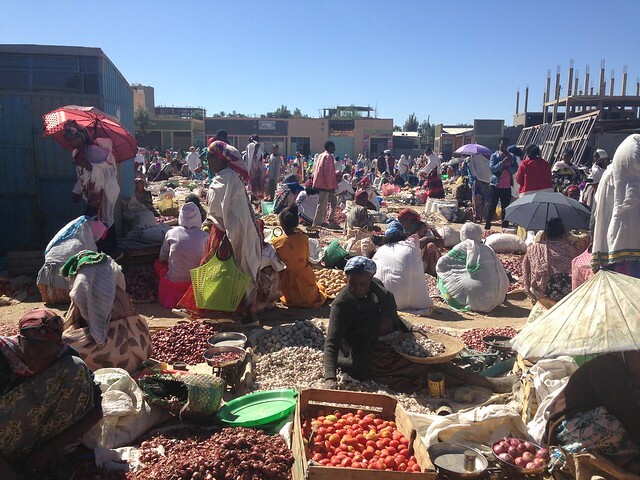 WUKRO, TIGRAY, 6 December 2016 – It was Monday morning when we came across the bustling market in Wukro. Tomatoes, onions and cereals are weighed and sold by women sitting on the ground, many of them wearing traditional white shawls. Crossing through the market stalls, we entered a small office, which operates as a factory and shop as well. Helen Hailu’s open smile welcomed us to this all-in-one space where she and two other women have launched an innovative and ecological business: they produce and sell reusable sanitary pads. 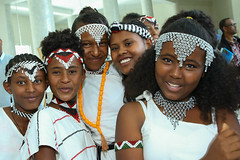 In Ethiopia, as in most countries, menstruation remains a taboo topic, often causing girls and women to be excluded from school and other activities. In Wukro town, this is changing. An integrated water, sanitation and hygiene (WASH) intervention being implemented by UNICEF, through its partner, World Vision, is raising awareness about menstrual hygiene among teachers, girls and boys in schools. The programme also promotes businesses such as Helen’s, to ensure that adequate and affordable products are available in the local market. Helen and Meaza Gebregzabher proudly explained how they were chosen by a women’s association and trained by World Vision to produce reusable sanitary pads before receiving sewing machines and materials. They decided to call their business Raig, the Tigrigna word for ‘vision’. Starting a business is always challenging, and this business is no exception. 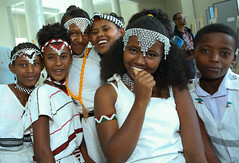 “It’s difficult right now to get money,” said Meaza, “some of the materials are bought in Addis Ababa and are expensive. We’re expecting you to raise awareness.” she added, kindly pressuring us, the visiting colleagues from UNICEF and World Vision. Perhaps business will pick up once the urban WASH water scheme is fully functional later this year, allowing easier access for women to clean the reusable pads. 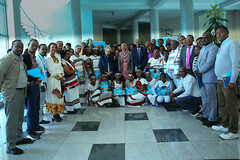 Also implemented by World Vision, the UNICEF-funded, Government of Ethiopia-designed programme will provide 100 per cent water coverage in Wukro and five satellite villages. An agreement has been signed between Raig and seven schools to provide 600 pads, and they aim to also sell to local women. “They are for schools, but also for the people in the village,” said Helen. I buy a packet of three reusable sanitary pads for 30 birr (US$1.30) and I’m offered a free sachet of detergent. “It’s a promotion.” explains Meaza. They have to compete with commercial one-time-use pads that are sold at 20 to 30 birr for a packet of ten. Helen and Meaza’s raig is that girls and women in Wukro use their ecological, effective and handmade sanitary pads while they’re menstruating; with the added benefit of ensuring business for the women. UNICEF’s raig is that all girls and women have the knowledge, environment and materials they need to have dignity and safety when menstruating. Promoting income-generating activities like this not only contributes to that aim, but it also offers sustainable opportunities for brave women like Helen and Meaza.